What Secrets Can Be Found by the Light of the Cajun Moon? New Orleans may be the “Big Easy,” but nothing about it was ever easy for international business etiquette expert Chloe Ledet. She moved away years ago, leaving her parents and their famous French Quarter restaurant behind. But when she hears that her father has been shot, she races home to be by his side and to handle his affairs—only to learn a long-hidden secret that changes everything she knew to be true about herself and her family. Framed for murder, Chloe and a handsome Cajun stranger must search for a priceless treasure, one whose roots weave through the very history of Louisiana itself. But can Chloe depend on the mysterious man leading her on this cat-and-mouse chase into the heart of Cajun country? Or by trusting him, has she gone from the frying pan into the fire? 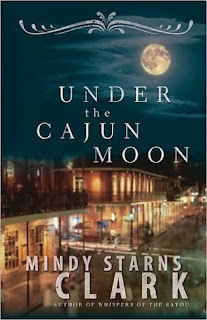 Following up on her bestselling Gothic thriller, Whispers of the Bayou, and Amish romantic suspense, Shadows of Lancaster County, Mindy Starns Clark offers another exciting standalone novel, one full of Cajun mystery, hidden dangers, and the glow of God’s unending grace.